In an age of social media obsession and digital absorption, sometimes it seems that all the kids do is play with their gadgets. A dedicated group of young people at Lake Wales High School is breaking that stereotype with their special devotion to horses. Agriculture teacher Paige Turner is proud of her horse judging team who recently placed second in the state preliminaries. They are the only team from Polk County to be advancing to the state level. The idea for the horse judging team came up last year. Two students who had prior experience with horses, Cassidy Jackson and Brianna Heath, thought it would be a fun and unique activity to revive at their school since there hadn’t been a horse judging team at Lake Wales in many years. 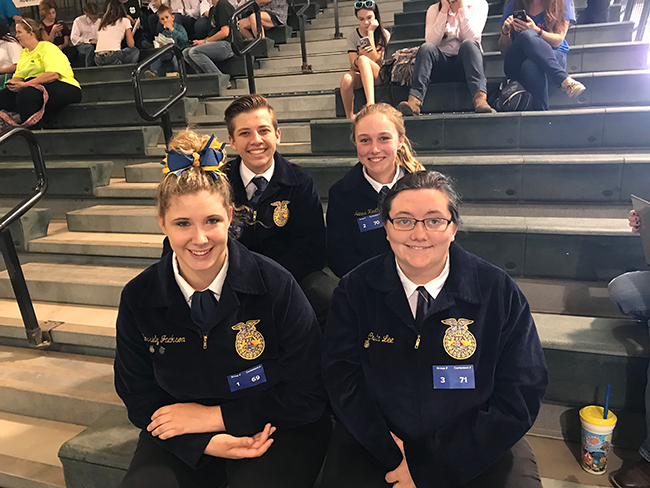 FFA teacher Mrs. Turner agreed to lead the group, and the students quickly recruited their classmates Bryce Gary and Crista Lee to take part as well. The devotion to this activity is evident in the students, as they sacrifice their lunch periods at least four days each week to practice. They also keep their grades up in all of their classes in order to have the freedom to miss class time for practice as well. The students often spend their time together watching videos of past horse evaluations and honing their judging skills online. Cassidy describes some of the criteria they look for while judging, “With confirmation, there are different factors we take into account. When we look at the horse we are basically looking for three circles. If the horse’s body fits in all three circles, we call it balance.” A horse must be muscled correctly and be even all the way around, and adhere to additional standards. To prepare for the upcoming state competition the students study a standard book to take a written exam. They also must be able to stand in front of a judge and orally justify their evaluations. It’s a challenging endeavor, and the students are taking this seriously. Their goal is to improve over their performance last year and place within the top five. Another student, Emily Grace Turner, has also been achieving great things with horses. She recently was awarded a rodeo scholarship from McNeese State in Louisiana for barrel racing. After attending a rodeo in Shawnee, Oklahoma, over the summer, Emily received the call from a coach at McNeese offering the scholarship. The amount of her rodeo scholarship will be dependent on how well she does at upcoming competitions, so Emily is working hard to secure those wins. She has been active in rodeo since she was ten. Her grandmother, who was on the professional rodeo circuit, first inspired Emily’s love of horseback riding at an early age. Emily is a senior in high school right now, and when she turns 18 she will be ready to join the ranks of professional rodeo riders. The determination of these kids to achieve their goals with horses is admirable, and they share that enthusiasm with others. With their influence, Lake Wales High School could soon be a top competitor in the world of horse judging. We wish these stellar young people all the best as they work towards their dreams!